Satish Hukkeri, the Training and Placement Officer of KLS Gogte Institute of Technology, Belagavi was recently awarded with a National Award as Employability Enunciator 2016. 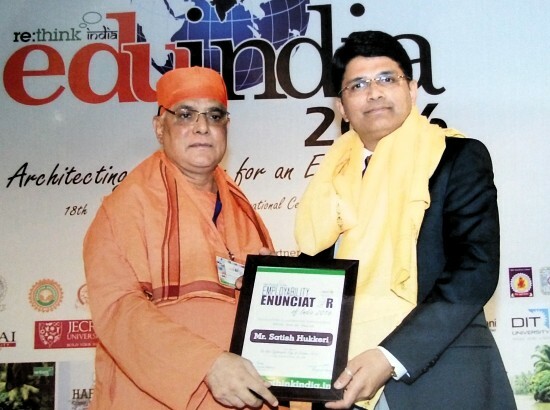 The award was presented by Swami Atmapriyanand, VC, Ramakrishna University, at the eduIndia Awards ceremony at India International Centre, Lodhi Road, New Delhi. The eduIndia is an initiative of reThink India an IIT Kharagpur organisation supported by Ministry of Human Resource and Development. It is headed by Prof. Raghav Mittal and Dr. Surbhi Vaish the founders. 15 Placement Officers were selected from 5000 applications received by reThink India. The online submission consisted of placement statistics of our college, vision and initiatives for enhancing placements in higher education colleges.